Cozy Chicks: Are You Listening? He (Jeffrey Cranor) and his co-writer Joseph Fink developed a podcast called Welcome to Night Vale about a year and a half ago. It's funny, it's mysterious and at times horrifying. Most of all it is completely unique. It went viral months ago and has even topped This American Life on the iTunes podcast top ten at times. It's a twice monthly show narrated like old time radio with the news announcer Cecil even making the weather in Night Vale seem bizarre. I cannot explain what is unexplainable. Just listen and you'll understand. 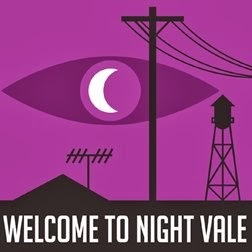 The episodes are downloadable free from iTunes and you can visit the Welcome to Night Vale Facebook page to learn more. shows seem to sell out immediately. 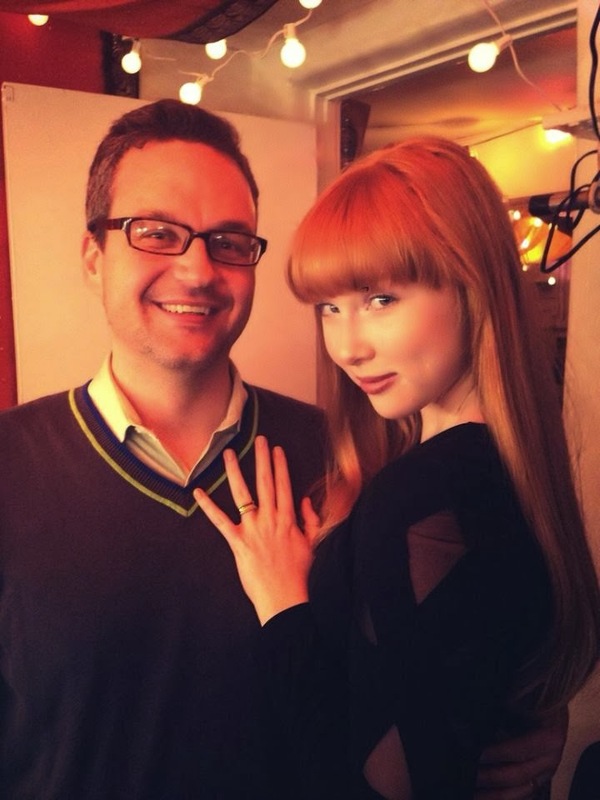 This picture is my son-in-law with Molly Quinn, whom you may recognize from Castle, taken backstage in L.A.
And to prove that even more great things can happen if you pursue your dreams, Jeffrey and Joseph recently signed with HarperCollins and there will be a Night Vale novel in 2015. I am so proud of you guys! So very happy for your success! Wonderful Leann, they sure deserve their success! But don't forget your self, you write very good cozy mysteries, and you and your husband are designing and building a beautiful house from scratch! Truly a talented family! Congratulations to you all. Congratulations to your talented family. Thanks Aurian. My husband is the one who should be proud of that house. He has worked so hard on a difficult project! Wow, this is fantastic, very exciting! I'll watch for Night Vale when it comes to Philly, can't wait. Fascinating as well as fantastic, Leann. And talented indeed. Must check out Night Vale. Exciting times! Congratulations to you and your talented family. Very impressive for all of you! I think Molly Quinn is very pretty. Love Castle. Thanks. She is so cute on that show and I think her real suits her perfectly! Sounds pretty cool. I just went and got all the podcasts on stitcher! I love the picture and will look forward to 2015 about the book. if your son would like to b write a blog have him send me an emal.